Digital temperature sensor with excellent accuracy over a wide temperature range. The sensor has a G1/4 internal and external thread and can therefore be mounted directly on a CPU cooler or a radiator to save space. 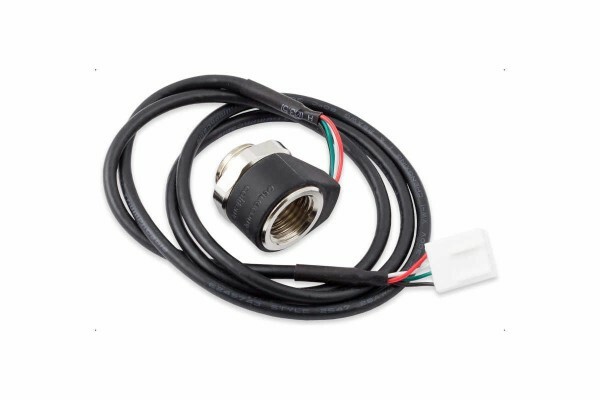 For operation, an aquaero 5 or aquaero 6 with firmware version 2100 or newer is additionally required, the sensor is connected to the aquabus connection of the aquaero. The aquaero supports a single Calitemp sensor without additional hardware. Alternatively, a maximum of four Calitemp sensors can be connected to an aquaero via an "aquabus X4". All aquasuite versions from 2017 require a valid license or activation. A valid license/activation for version 2018 or newer must be available to operate this sensor or can be purchased additionally!